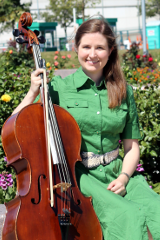 Jennifer joined School House Symphony in 2014 as cellist. Jennifer is a member of the Springfield, Ohio Symphony and the Hamilton-Fairfield, Ohio Symphony cello sections. She performs regularly with her husband Arturo as the Araya Duo. The couple have gained regional notoriety for their fresh presentation of chamber music works for cello duo. Jennifer also performs widely as a vocalist, appearing in musical theater and operatic productions around Cincinnati. She has performed as a cello soloist with the Hamilton-Fairfield Symphony and the West Virginia University Arts Orchestra and as soprano soloist with the Springfield Symphony, the Hamilton-Fairfield Symphony, the Fairmont State University Orchestra, and the University of Cincinnati College-Conservatory of Music Chorale. Her solo recitals have been enjoyed by audiences in West Virginia, Ohio, and Virginia. Jennifer is the recipient of the Hedricks Chamber Music Performance Grant and the Margaret A. Wulsin Career Development Grant. She is a graduate of the University of Cincinnati College-Conservatory of Music and has studied with Lee Fiser (LaSalle Quartet, University of Cincinnati College-Conservatory of Music) and Daniel Culnan (Assistant Principal Cello, Cincinnati Symphony Orchestra). Todd joined School House Symphony in 1984. He received a Bachelor of Music in French Horn Performance from Manhattan School of Music and a Master of Music in French Horn Performance from the University of Cincinnati, College-Conservatory of Music. Todd’s accomplished career playing french horn includes his performances with these local and regional arts organizations: He currently plays with the Dayton Philharmonic (Dayton, OH), 3rd Chair since 1984; Hamilton Fairfield Symphony Orchestra (Hamilton, OH), Principal since 1980; Clermont Philharmonic Orchestra (Clermont, OH), Principal since 1997; Dayton Philharmonic Concert Band (Dayton, OH), Principal since 1984; Hamilton Concert Band (Hamilton, OH), Principal since 1980; Dayton Philharmonic Opera Orchestra (Dayton, OH), 3rd Chair since 1984; Blue Ash Montgomery Symphony Orchestra (Blue Ash, OH), Principal and 3rd Chair since 2005; Quintessence Woodwind Quintet (Cincinnati, OH), since 1980; and has also performed with the Simon Winds (Cincinnati, OH), Queen City Brass (Cincinnati, OH), Carillon Brass Quintet (Dayton, OH). Todd is also an accomplished soloist and instructor. He has performed concertos with the Hamilton Farifield Symphony Orchestra, The Clermont Philharmonic and the Blue Ash Montgomery Symphony Orchestra. His notable performances with world renowned artists include Yo Yo Ma, Yitzhak Perlman, Emanuel Ax, James Galway, Renee Fleming, Tony Bennett, Rod Stewart and Sheena Easton. 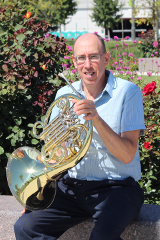 Todd has taught private students from the School for Creative and Performing Arts (Cincinnati, OH), Princeton High School (Cincinnati, OH), and has served as adjunct professor of french horn at Cedarville University. Todd resides in Loveland with his wife Sharon and he enjoys keeping up with his three children. Jin Hand joined School House Symphony in 2016. She is an award-winning soloist, chamber and orchestral player and an active teacher. She has performed with the ASU Symphony Orchestra, ASU Lyric Opera Theatre, and the Copperstar Repertory Company as a principal flutist. She won second prize in the Alexander Buono International Competition and was invited to play at the Kosciuszko Foundation Auditorium in New York City. As the winner of the Concert of Soloists Concerto Competition, Jin was a featured soloist with the Arizona State University Symphony Orchestra. Jin holds her Bachelor of Music from Indiana University, Master of Music from Arizona State University, and is currently completing the final requirements for the Doctorate of Music from Arizona State University, where she served as a Faculty Associate during her doctoral studies. 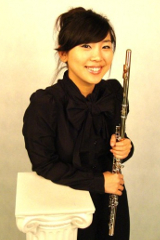 She was invited as a Guest Director for the Phoenix Youth Symphony Orchestra and the ASU Community Flute Ensemble. Jin currently resides in the Cincinnati metropolitan area and is active as a freelance performer, playing on occasion with orchestras in the area, including the Clermont Philharmonic and Middletown Symphony Orchestra, and as a flute instructor, teaching private lessons and serving as a guest clinician at local schools. 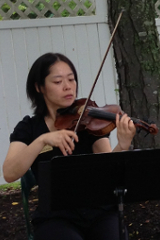 Haejin joined School House Symphony in 2016 and plays violin in the ensemble. She received a BA, Music from Manhattan School of Music (New York, NY), and a MA, Music from Aaron Copland School of Music from Queens College (New York, NY). Before Haejin moved to Cincinnati in 2010, she lived in Greenville, South Carolina where she taught at North Greenville University and Bob Jones University. She has also performed with Greenville Symphony Orchestra and Spartanburg Symphony Orchestra. Haejin currently performs with several local ensembles including Hamilton Fairfield Symphony Orchestra, Kentucky Symphony Orchestra, Clermont Philharmonic Orchestra, Ohio Metropolitan Pops Orchestra, Blue Ash Montgomery Symphony Orchestra and Mt. Carmel Baptist Church. 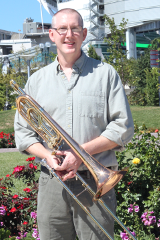 Glenn maintains a private teaching studio in West Chester, teaching trombone, tuba, and euphonium/baritone. Glenn is also an active triathlete, a first degree black belt in Japanese Karate-Do, and an avid gardener. Laura joined the ensemble in 2013. She is a classically trained musician who has crossed to the dark side of improvised music and never wants to go back, except occasionally when she gets to perform with wonderful ensembles such as the West Virginia Symhony Orchestra, the Richmond Symphony Orchestra, and Concert:Nova. She fell in love with music as a child when she would sneak into the basement after dinner to spend hours listening to old records. Her impatience chose saxophone as her first instrument in fourth grade simply because the line for flute was too long. Although she was reduced to tears when her private lesson teacher forced her to switch to clarinet, it has proven a fateful match. Her teachers have included members of the Cleveland Orchestra and Cincinnati Symphony Orchestra. She has received degrees in music from the Ohio State University, Cleveland Institute of Music, and recently completed her doctorate from the College Conservatory of Music at UC. Still, she is consistently lured away from the classical world by the expressive, soulful wailing made by gypsy and folk clarinetists of Turkey and Eastern Europe, and finds her truest musical self playing original gypsy jazz with the Marmalade Brigade, Cajun and Dixieland with Lagniappe, trance/belly dance with Mayan Ruins, bass clarinet with Strange Creature, and early music with the Noyse Merchants. She maintains a changeling/amphibious lifestyle between the airy heights of a trained classical musician and the watery depths of expressive improvisation. 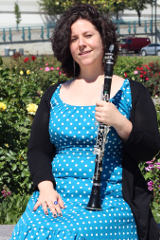 She is also the organizer/impresario for Classical Revolution Cincinnati and teaches private lessons at the Cincinnati Music Academy and all around the Cincinnati area. Terrific musicians. Very knowledgeable on core content, kind to the students and play anywhere from a gymnasium to a small classroom. We are delighted to have SHS come to our school. Each year, both staff and students look forward to these performances.